Chalet La Sache is situated in Tignes Les Brevieres, a beautiful traditional Savoyarde village dating back to the 13th century and fully integrated into the vast Tignes/Val d’Isere ski area (Espace Killy 1550m-3,550m). 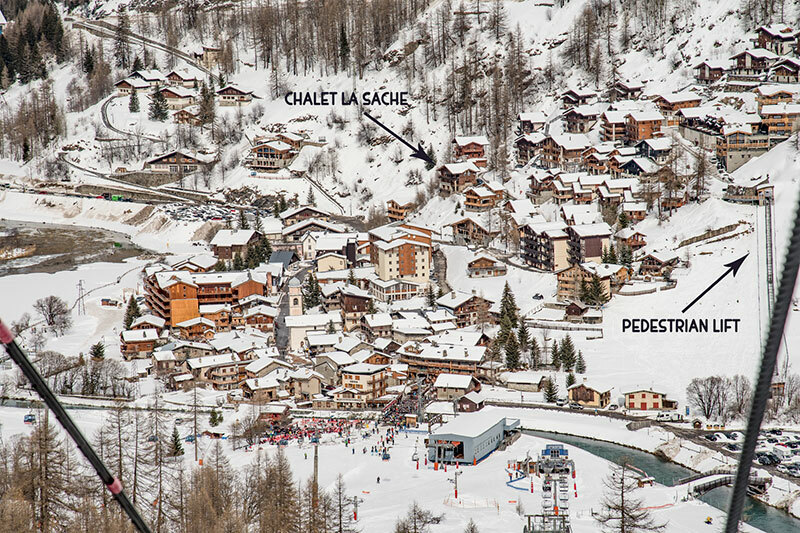 Our Chalet is located approximately 300m from the ski lifts on the left side as you enter the village, with an uninterrupted view over the village, pistes, and mountains. See the Travel Section for more detailed information on your transfer options and directions getting to the resort. There is no need to walk to the pistes or ski school as our private chauffeurred mini-bus is on hand to take you where you need to go and pick you up at the end of the day. We also have plenty of free private off street parking at the chalet for your cars. There is a pedestrian lift conveniently located about 100 m from the chalet to add to your choice of how to get to the Brevieres ski lifts. Two main options exist, either follow the motorway via Chambery or take the N90 road via Annecy to Albertville. We would recommend the motorway as the N-road can get very blocked with traffic. IMPORTANT: Please note that the Col Du Petit St. Bernard is closed during the winter months. Some route finder websites (including Google Maps) and car GPS Sat Navs do not recognise this and propose a route through the Mont Blanc tunnel and the Col Du Petit St. Bernard mountain pass – IGNORE this routing and opt for one via Annecy – Albertville – Moutiers – Bourg St. Maurice to Tignes Les Brevieres or the motorway towards Chambery then Albertville etc. There is a beginner slope (Pitots), a blue slope (Myrtilles) as well as a red slope (Pavot) in Brevieres. The 10km black run called La Sache, that descends from the top of the L’Aiguille Percée, through a spectacular valley to Tignes Les Brévières is probably the most challenging run in the resort…. A fast 6 person Sache bubble lift takes you to two chairlifts, both giving access to Tignes Le Lac via a blue slope (Rhododenron and Petit Col) or a red slope (Bluets). There is also a free 4 person chairlift (Brevieres) connecting with Tignes Les Boisses and a free beginner button lift (Pitots). Tignes’s famous rock formation – ‘the Eye of the Needle’ which is the most famous Espace Killy’s Landmark is just the Sache bubble and a one chair lift away!